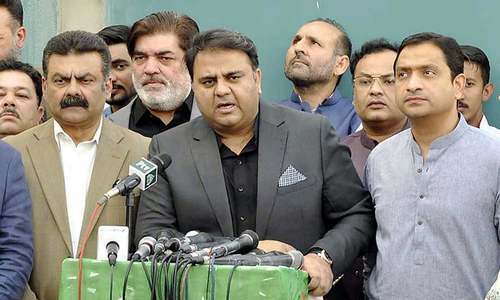 LAHORE: Information Minister Fawad Chaudhry has said the government is preparing a strategy to tackle violent protests and hate speech on sensitive religious issues “without flexing state muscles”. “The interior ministry has been given a task to devise a comprehensive strategy to ensure that no violent protests take place on roads and common people’s lives and properties are protected,” he told a news conference at PID office here on Monday. 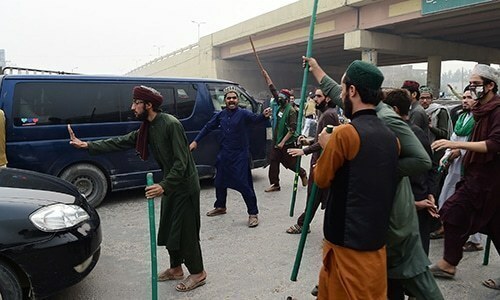 Lauding opposition parties’ maturity in the wake of violent protests across the country following Aasia Bibi’s acquittal in a blasphemy case, Mr Chaudhry said the growing problem of violent protests on sensitive religious issues would be tackled as a part of national security in consultation with the opposition parties. He said the federal and provincial governments were busy identifying miscreants who damaged public and private properties and injured people during the three-day countrywide protest last week. Regretting that the miscreants under the garb of religion burnt private vehicles and even humiliated women, he said: “All provincial governments are required to compensate the damages caused to common people’s properties and physical injuries.” The Centre would also extend assistance to the provincial governments, he added. 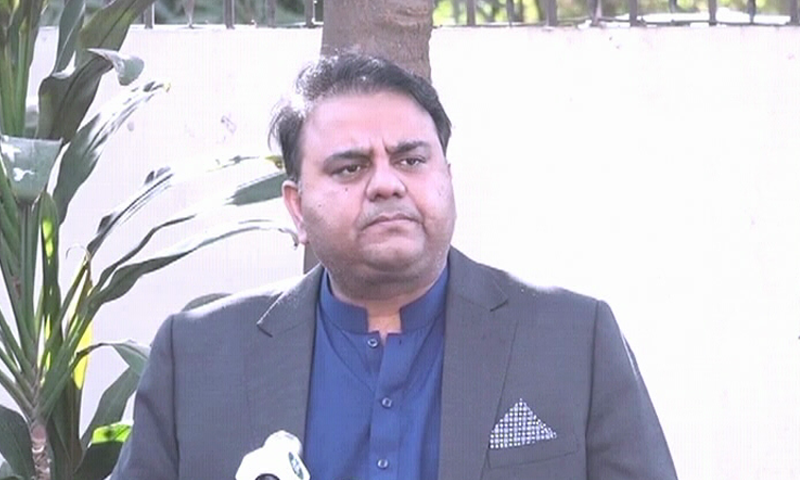 Acknowledging Facebook for blocking hundreds of accounts found spreading hate material, Mr Chaudhry stressed that social networking site Twitter should also consider the religious sensitivity and block posts fanning sectarianism in the country. Referring to the Pak-China collaborative space programme, the minister came down hard on certain religious leaders, saying: “Those spreading religious extremism and anarchy in the country should be sent to space — for good.” In the same breath, he said some politicians also needed to be sent to space. About checks on hate material on social networking sites, he made it clear that the government had no intention to block freedom of speech and said the Pakistan Tehreek-i-Insaf government was accepting criticism wholeheartedly. He said the opposition parties tried to make a hue and cry while alleging rigging in the general election but could not come up with any evidence. In order to satisfy the opposition, he said, the prime minister had constituted a committee and the voices of rigging allegations died down. 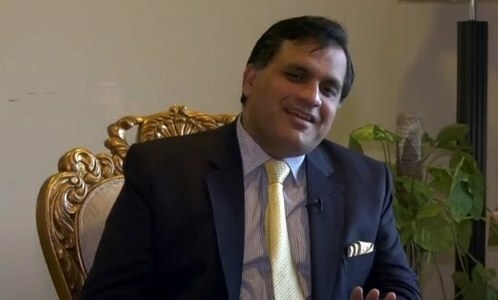 Responding to PML-N spokesperson Marriyum Aurangzeb’s comment that the PTI criticised the CPEC at home and applauded it in China, Mr Chaudhry said the PTI government was always for the corridor project and now working to expand it and explore more opportunities in the agriculture sector, establishment of industrial zones and creation of new jobs. 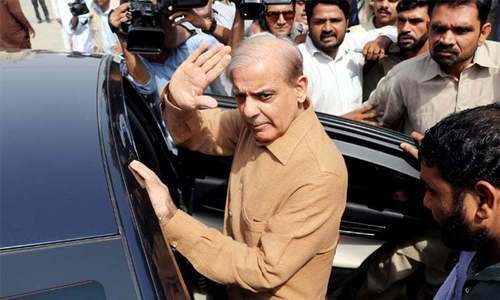 “Opposition leader Shahbaz Sharif in his speech in the National Assembly tried to create an impression that a case lodged against him may affect Pak-China relationship,” he said and added that countries’ relationships were based on strategic interests instead of personalities. Mr Chaudhry said Pakistan’s relations were improving with China, Saudi Arabia, the UAE as well as the United States. Pakistan’s relationship with the European Union was also expanding, he said, adding that PM Khan was offering a quality leadership to resolve issues confronting the Ummah. In reply to a question about financial crunch and lay-offs in the media, the minister said media organisations should redo their business model. He said the government’s share of advertisement to the media was just 20 per cent, compared to 80pc private sector advertisement. “The cuts from 20pc advertisement cannot be blamed for lay-offs in the media industry,” he added. He said the country was facing financial challenges and the government could not offer advertisements worth billions of rupees. Assuring that he was standing by journalists’ bodies, the minister said the government was also ready to support the media industry on a short-term basis. Reacting to the information minister’s anti-Tehreek-i-Labbaik Pakis­tan assertions, the TLP leadership said they reserved the legal right to take Mr Chaudhry to court on the issue. TLP patron-in-chief Pir Mohammad Afzal Qadri on Monday warned of retaliation if “violations of the agreement between the party and the government do not stop immediately”. In a video message, he said all those who had participated in negotiations and signed the agreement should stay warned that no violation (referring to registration of FIRs and arrests of workers) would be tolerated. “The TLP will again be on the roads, with full zeal for martyrdom. The leadership and workers of the party are not afraid of anybody. All workers should start preparatory meetings as they can be told any moment to hit the roads. Ultimately, the truth will prevail,” Mr Qadri said. Meanwhile, a late-night text message by the TLP claimed that they were in talks with a Punjab government team over the arrest of their workers. Government is saving face now! Nothing will happen. Ultimately, every FIR in this respect will be quashed, and no violator will face court case. the TLP leadership needs to be taken to task for threats to public peace and security. The truth is so misconceived idea; though it is obvious. If destroying property and creating inconvenience for people is truth and that will prevail, Mr. Qadri, then dont try to impose your truth on the entire population. It is called chaos, not the truth. Then they will hit the roads face first. What? National Action Plan is already in place, probably Fawad memory is like EPROM (Erase able Programmable Memory which needs power hooked up all the time), all the NAP data didn't store due to power loss in 2013 elections in in Pakistan. Now he wants to redo another NAP with power restored in 2018 election. There is no way out for PTI government. They have tasted blood. Will be tough for the government to rein them in now. Let's get rid of TLP once for all. U turn policy would cause trouble... on the first place the agreement must have been clear... now if it is signed by both parties , they must abide by the agreed terms. Is court order have any value in Pakistan? Is there a provision in constituency to make private agreement like this? OK, but no support from PPP and PML-N.
Lay down, in another word surrender. Thinking to transfer investment from Pakistan. The state has failed to protect its citizens and their properties. 'curb violent protests, " “without flexing state muscles”. is a new invention? PTI should apologize to the nation for such humiliating agreement with this group. PMLN should do the same as they did the same during their tenure. Agree ... that is the Permanent solution!!! No human rights violation involved. The state should't have made an agreement. It sent a message. The state should have taken preventive measures. The people have a right to have peaceful demonstrations. When they turn violent, the state has the right to 'handle' them accordingly. Every moment we preach hate and want peace. Nation saw grown ups stealing bananas from a child, thugs will be thugs, pity is that no one came to his defense. That kind of sums up character of this nation. No matter how long beards you grow, or what religion you follow; if you are willing to steal from a boy, who is trying to make a living for his family, that nation deserves punishment of the severest type.Ashamed of you Pakistan. We appreciate if this happens but when you negotiate with them, it will never happen in a million years. 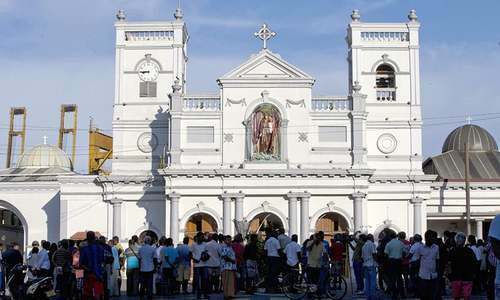 Government must give printed sermons to mosques. They must be monitored. Referring to the Pak-China collaborative space programme, the minister came down hard on certain religious leaders, saying: “Those spreading religious extremism and anarchy in the country should be sent to space — for good.” In the same breath, he said some politicians also needed to be sent to space. Pity he forgot himself. One good thing about the opposition parties is: they didn't try to encash the violence. Most mature behavior. Pakistan has to ELIMINATE the violence culture AT ANY COST. Else, get ready for the doomsday. Everything else will fall in line for well being and prosperity. TLP must think twice before hitting the road again.This time,it will fail to organise massive protests and Government will be waiting to pounce on them.They must understand that there is a very thin line between peaceful and violent protests. 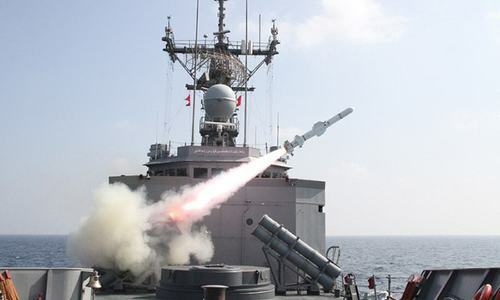 Mr.Fawad Choudhry must not waste time and energy on sending people to space.He needs to devise a mechanism to control violent protests. In my humble opinion Fawad Chaudhry has the most important assignment in this government. Our society HAS to make a basic decision. He has to deliver the truth about these fanatics right up to the masses, well beyond the small percentage of media aware population. Force will not achieve what knowledge will. I hope he can do this. Any 'comprehensive strategy' should not allow any protest(s) etc to happen on or near any major road network or in cities. Then who would want to protest outside cities in wilderness where there will get no publicity/show of power etc?!! So we are back to the one and only solution. Army can do a better job then PTI, I'm loosing faith in PTI. "The TLP will again be on the roads, with full zeal for martyrdom": such messages show as to how "wild ignorance" of such organisations can lead to a disaster for the country; and the state must not allow this to happen. Another U Turn can be expected from the Govr as regards arrested workers. Most will be alloeed to go. They have the audacity to openly threaren the State. It's time the government resorted to biting the bullet ......and doing what eventually they would have to do......procastanation is not the answer. So TLP is ready to take the Minister to the same court that they abused and claim that it cannot dispense justice? If Altaf Hussain was given a verdict within minutes, why is this being lingered on? You are living in a fool's paradise if you could control violent protest and hate speech without flexing states muscles. When ever the TLP goes out of pocket, it will find some issue to get it replenished in 3 days. Another round of tough talk from the govt followed by abject surrender? A beautiful distraction from all the recent price hikes done by Naya Pakistan government. Everyone is talking about these issues. Wait till your monthly expenses touches the sky then we will see what are the main issues for commoners. This is not the change people voted for. It is becoming impossible for commoners to bring food to the table for their families. While Corruption Mafias are roaming freely with VIP protocols. PTI why throw boomerang first and cry when it comes back? You have taught this dharna lesson to masses, now it's hard to unlearn bullying that has successfully worked twice. Work on education of Pakistan, social education and tolerance learning. Set an example not a warning. PTI is turning out to be an utter disappointment. All talk no action. TLP is going to replace TTP albeit in an altogether different approach. Both are threat to the peace, prosperity, and progress for the nation. State should flex muscles against anti-democratic and anti-minority forces. Taliban used to be so vocal and they attacked GHQ also, now these guys are threatening government plus army. I think there must of a lot of their elements in the government plus the armed forces. until and unless the government make a serious honest pledge to clean Pakistan top to bottom this issue will haunt the nation for centuries. Sadly all political parties pretty much use these goons to their convenience. Its a national menace, we can only pray i guess. @Truth is truth:, This is PTI. No deals. So they were your thugs involved in vandalism. 10 year sentencing. No law or strategy works without commitment and will to implement it. Hit it where it hurts, so no one dares to ever try it again. People have to know what the consequences are for hate speech and destruction. And the consequences need to be harsh.Period. How about hate speeches against our neighboring countries. @Iftikhar, So right, once there was Altaf and now we have Khadim. What is the process of applying for citizenship of this great country? No need to state this in the press, just make the strategy? or make a statement after the strategy is made. Religious vote bank to important to mess with! Nothing but words and no action!